Michael Suddard: Canadian Mint pulls one over the U.S.
Canadian Mint pulls one over the U.S. 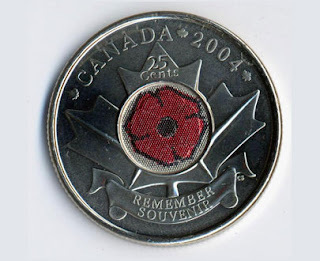 It is hard to believe that American intelligence was all up and arms over a measily Canadian quarter. But that is what happenned in 2004 and onward as American contractors reported to the U.S. Defence Department after visiting Canada. The contractors were reporting that the quarters were showing up on their pockets and appeared to have radio frequency transmitters. Aparently the U.S. Defence Department needs to find some brighter contractors. This is because the question of "how did these mysterious coins get there?" is easy to solve. Might these contractors have stopped off at a Tim Horton's for a coffee and received change back? Probably. Since the Canadian quarter is one of the most used coins in Canada and coins tend to end up in pockets, PRESTO! a Canadian quarter ended up in the contractor's pockets. But if the Defence Department actually hired smart contractors, the problem of the coins mysteriously appearing in pockets may have never arisen. And Canadians wouldn't have been able to laugh at the crazy Americans. It has been said before Canada has funny money, but in this instance a mere twenty cents just proves it!